THERE aren't many media outlets that allow for such candid moments as those of Michele McDougall and her co-workers than on Citytv's 4-hour (6-10AM) morning show Breakfast Television. I'm sure I can speak on behalf of the spirited program's loyal audience, and say that we wouldn't want it any other way! Weather specialist and BT co-host McDougall, known for her devoted positive disposition and passion for her craft, hails from Brandon, Manitoba, where she realized her knack for camping, fishing, hiking and all things "green." It was also where she pioneered her current meteorological route, studying journalism and broadcasting before joining Citytv in 2000. "My favourite part of working for Citytv is reporting the weather," said McDougall. "It fascinates me, and as we know around here, is always changing, keeping forecasters on their toes." 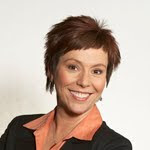 McDougall joined the Breakfast Television crew in September 2006, and continues there as its weather specialist. She also hosts the brief segment "Fresh Air Photo of the Day" (at about 7:10AM each Monday-Friday), which is how my association with Ms. McDougall began. 1. What is one thing about Edmonton that you think stands out from other Canadian cities? Our most fabulous, beautiful, and breathtaking river valley. 2. Do you have a favourite place to visit in Edmonton? Our most fabulous, beautiful, and breathtaking river valley :)!! Any of the bike trails do the trick for me. 3. If there was one thing you could do to improve our city, what would it be? Reward neighbourhoods for cutting down on graffiti, litter, and crime. The reward would be a family-friendly neighbourhood street party...not to mention pride of ownership. 4. Whyte Ave. or Jasper Ave.? Jasper Avenue all the way! Some of Edmonton's oldest hertitage buildings stand proudly on Jasper Avenue, including Hudson's Bay and Hotel Mcdonald. 5. What radio station(s) do you listen to the most? I love radio--everything from talk to rock. But I am a dial junkie, and can go from Sonic to The Bounce to CHED, and not miss a beat. 6. If you could sum up the city of Edmonton in three words or less, what would they be? Great community spirit. I love Michelle, shes my favorite one of BT, but I have to say whyte ave, sorry. They're all great on BT, but Michele is also my favourite (sorry Ryan, Asha, Bridget & Wendy! )...I guess I'm a bit bias. As of right now I'd go with Whyte Ave., but Jasper's gonna be a whole new entity over the coming years.